Riding the successful 2005 launch last year of its Spenco® Ironman Cycling Gloves for triathletes and road cyclists, Spenco today announced the introduction of its Spenco® MTB Series Cycling Gloves for mountain biking and BMX. Most of the new gloves will also feature the patented Shock-Tek® design in the design padding, which reduces hand numbness and fatigue caused by road and trail vibrations. "We've been getting tremendous feedback on our short-fingered gloves from road cyclists, triathletes and retailers," says Mary L. Brown, Vice President of Fulcrum Health Products, which markets the gloves. "We're in over 1,000 bike stores and our Web site has directed almost 50,000 consumers to a retailer near them. It is a logical step to extend the patented Shock-Tek design and create a full-fingered glove for mountain biking, BMX and cold-weather road cycling." Two of the three new MTB Series gloves feature the Shock-Tek design. This technology, developed by Detroit, Mich. neurosurgeon Dr. A. Robert Spitzer, includes a patented groove in the palm of the glove over the carpal tunnel nerve. This groove reduces road shock and minimizes pressure and vibration on the median nerve. Heat Wave Anatomically pre-curved with Shock-Tek technology. Has dual mesh and stretch nylon spandex for ventilation and finger dexterity. Reinforced second layer on thumb, index finger and base of hand increases durability. SRP: $27.99. Trail Pro Anatomically pre-curved with Shock-Tek technology. Has molded neoprene padding across fingers and knuckles for comfort and protection. Synthetic leather palm, thumb and fingers will not shrink or harden. SRP: $29.99. Cold Snap Anatomically pre-curved with soft fleece lining for warmth and comfort. Neoprene cuff with wind gusset keeps the cold out. Reflective piping for safety and silicone dots for increased grip. SRP: $39.99. 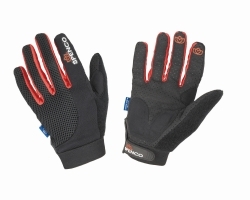 The Spenco MTB Series gloves are distributed by Quality Bicycle Products in Bloomington, Minn., which is a leading bicycle products distributor. "In less than a year, the Spenco Ironman gloves have become one of our top selling cycling gloves," says Nick Essma, clothing product coordinator for Quality Bicycle Products. "We're looking forward to similar great success with the new Spenco MTB Series." Log on to www.spencocycling.com or call 1-800-229-1380 for more information.